Is your business experiencing a productivity leakage? A business is like a car, if the engine oil is leaking, the car might continue running, but it will go at a slow pace until it finally stops. Are your staff trained to use Microsoft Word, Access, Excel and PowerPoint officially for high productivity? At one of our clients, a bank, we conducted summitPRODUCTIVITY Toolkit Training to Managers and operational staff by automating MS Word processing using macros and reduced costs by 20% in just three months! Training staff in office tools fixes their leaks caused by inefficiency and lack of knowledge. 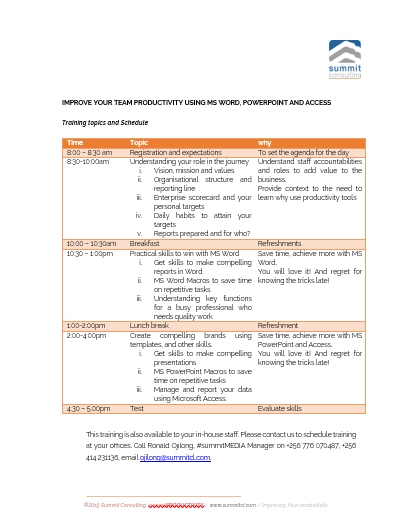 This is to invite you to attend our invite-only summitPRODUCTIVITY Toolkit Training covering Word, Access and PowerPoint for quality reporting. Why: Learn how to harness Microsoft’s productivity tools to deliver high performance. Get your employees to work smarter and boost productivity. The training shall be facilitated by Microsoft experts with case studies and experience sharing. 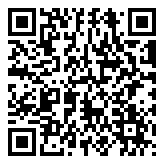 This is an invitation to attend the training. Our capacity for the next intake is limited to 10 – 15 persons. First come, first enrolled. This training is also available to your in-house. Please contact us to schedule training at your offices. The summitPRODUCTIVITY booking ticket is sold out. You can try another ticket or another date.